Ben & Jerry's is currently firing on all cylinders. Next Monday, they're introducing BRRR-itos to a crowd of grateful potheads and this fall, they'll earn their very own beer. The ice cream authorities have teamed up with New Belgium Brewing to produce the Salted Caramel Brownie Brown Ale. Clocking in at 6.3% ABV, this brew promises to combine your two favorite fatteners (ice cream and beer) into one dynamic bottle. 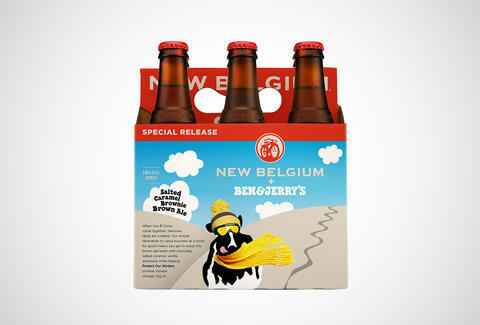 Little is known about the beer at this time, though New Belgium and Ben & Jerry's are planning to use it to draw attention to issues of mutual interest. As Beer Street Journal has pointed out, that issue is almost definitely climate change, since it gets a shout-out on the six-pack, alongside the group Protect Our Winters. Concrete details will be revealed as we get closer to the fall, but for the time being, you'll just have to drop Ben & Jerry's brownie chunks into your preferred brown ale. Kristin Hunt is a Food/Drink staff writer for Thrillist, and would like to know where this was during the soul-crushing winter that just ended. Follow her at @kristin_hunt.